Energy security and legal compliance are the US Navy Energy Program's missions. 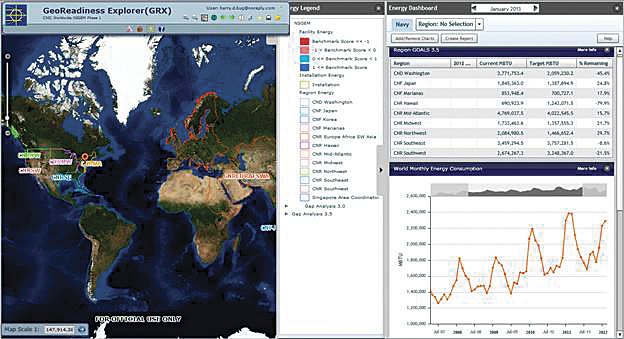 US Navy Energy Program's new ArcGIS dashboard increases data credibility. Energy awareness is becoming a major focus for the United States federal government as both costs and demand rise. Budget constraints across the military services put further emphasis on the need to secure the nation's energy supplies and create federally mandated programs. Advancing new technologies is key to the program's goals of streamlining the capture of data, leveraging business systems that contain energy consumption information, and combining them to create powerful tools for the program managers. The program aims to provide a means of measurement and verification and, most importantly, the knowledge base to make more informed decisions. The CNIC HQ Energy Program manager, Sandrine Schultz, had a vision of an overarching geospatial tool that would provide the navy with centralized information access for tracking, measuring, and planning energy usage to meet the program's goals. Previously, there was no effective way of visualizing and displaying the important tabular data in the business systems that tracked energy usage. Schultz knew that Esri Platinum Partner Geographic Information Services, Inc. (GISi), of Birmingham, Alabama, was already supporting the Naval Facilities Engineering Command's GeoReadiness Explorer (GRX) enterprise map viewer application, which contained worldwide geospatial data and services for business lines across the navy. Thus, she contracted GISi to review the navy's current energy appraisable capabilities and build an energy dashboard within GRX. This was possible because GRX is constructed on a .NET Framework using Adobe Flex, ArcGIS API for Flex, and ArcGIS for Server. This geospatial energy analysis solution would leverage that existing framework and ultimately become the Navy Shore Geospatial Energy Module (NSGEM). As the NSGEM team started development, the data sources were gathered and compared. Initial benchmark scores were calculated for energy consumption and goals for reduction set. This in turn established the baseline metrics needed to go forward with the program's mission. 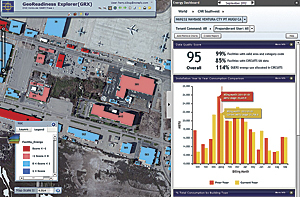 A gap analysis was performed initially to identify disparities between the main data sources: the navy's real-property database, the utility allocation and billing system, and the GeoReadiness worldwide geospatial data. This effort pinpointed further needs and issues and generated the data quality score shown in the current interface. Data validation and correction are key components, and one of the most challenging aspects, to providing NSGEM functionality. "What's very important is for people to become accountable for their data," Schultz says of the navy data owners. "Their data is really telling their story." Agnes Sullivan, Regional Energy Program manager, Commander Navy Region Mid-Atlantic, says NSGEM is "really useful because you can visually see and manipulate the tool in various ways that serve the user. It is not limited to generic automated reports and can customize or drill down to whatever levels you need to see." 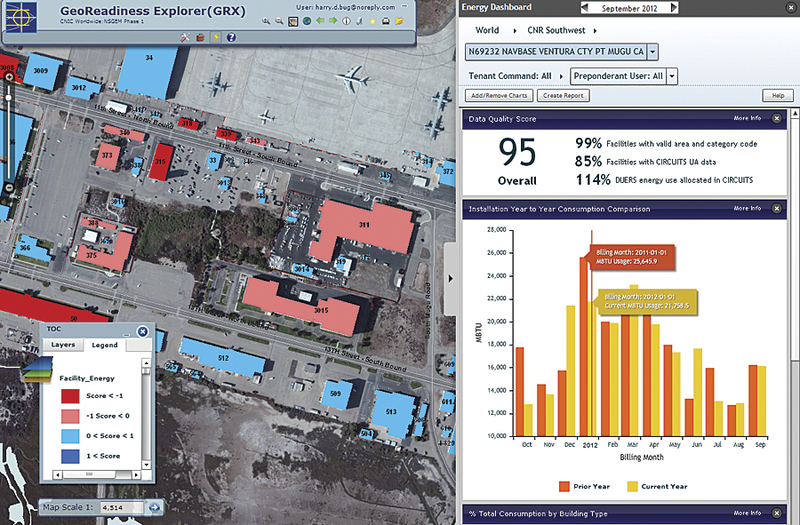 "Geospatial capabilities are changing the way that we all do business. We turned data into decisions," says Schultz.